$25 off a Dex while this message shows. Literally a couple of minutes in the morning and in the evening can make a huge difference in how you feel. Perform rotational twists, back extensions and abdominal curls. Build strength and improves flexibility for the back, neck, shoulders and stomach. Absolutely Amazing! The Teeter Hang Ups Dex II hold the user in a 90/90 position, which is the optimum position for decompression. The user is in a body position relevant to gravity that maximizes decompression. 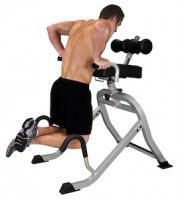 It also maximizes muscle performance during back extensions while helping to prevent hyperextension. The unique design reduces any load on the ankles unlike inversion tables. The Dex II actually reduces the load on the hamstrings by placing the knees in the relaxed 90° position, rather than forcing less-effective, straight-legged exercises. * Convenient features: Lower handles provide support for user-controlled rotation; serve as useful resistance tools for stretching. * Sturdy Lap Support: Holds the user in a fixed 90/90 position for a variety of inverted stretches and exercises. * Adjustable Leg Supports: Locking knob allows adjustment for maximum comfort and security. * A unique solution for stretching the lower back: Offers increased decompression of the spine to maximize effectiveness. * Sturdy Lap Support: Holds user in fixed 90/90 position for inverted stretches and exercises. * Corner feet: Provides stability, prevent sliding and protect floors. * Washable Padded Vinyl Mat: Quality materials are durable and easy to clean. * Quality Construction: Sturdy square steel tube design. * High Quality Finish: Durable powder-coating ensures scratch-resistance. Millions of working days are lost due to back pain and injury. It's the leading cause for absenteeism from work. Beneficial for employees in all types of roles. Whether at a desk, using machinery, lifting duties, or car bound, Inversion can help. In professions where fitness is vitally important, Bent Knee Inversion is a must. Injury to the back is caused by poor posture and the spine being ill prepared to perform repetitive or strenuous movements. Using the Dex II prepares the back for these tasks by a series of simple exercises, which result in a healthy and stronger back. Less than two minutes a day will help. Boxed Dimensions: Approx. 40" x 29" x 9"
* Provides a fast form of warm-up..
* Improves back and abdominal strength. * Prevent Injuries from happening. * Achieve functional fitness, a state of flexibility, strength and balance that supports youthful movement and activity. Inversion is a natural form of traction that uses your own body weight and gravity to decompress weight-bearing joints. While the body is rotated and suspended, gravity’s force applies traction, resulting in a customized stretch that elongates the spine, increasing the space between the vertebrae, which relieves the pressure on discs and nerve roots. Less pressure means less back pain. Inversion may be best known as a method to relieve back pain, but it’s also an effective way to stretch and relax muscles, reduce stress and tension and provide healthy movement for ligaments. 4. Return to standing position slowly, with deep exhalations. Disclaimer: As with any fitness program, people should consult with their medical advisor before beginning inversion therapy. In general, contra indications for inversion are for health problems related to eye pressure, heart or circulatory problems, spinal injury, or bone weaknesses or fractures.